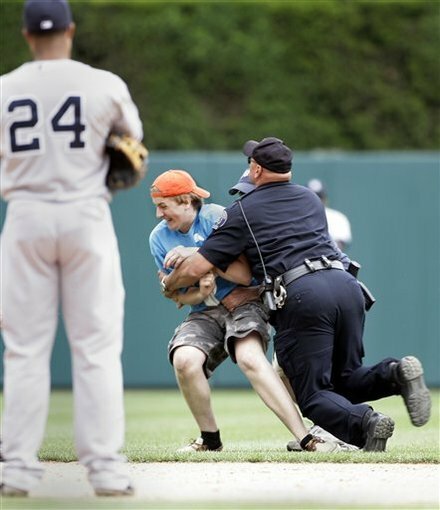 You never know what to expect when a fan runs onto a field at a sporting event. Sometimes they steal the football from Brett Favre. Sometimes they get tasered. Sometimes they get chewed out by Dan Dierdorf. And in this most recent case, this afternoon at Comerica Park in the game between the New York Yankees and the Detroit Tigers, they want to get a high five from Nick Swisher. Let's go to the videotape. that was hilarious i was in section 334 third baseline upper box on my way down the stairs to leave... had to stay and watch this guy get his standing ov!